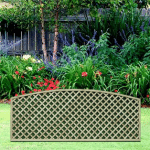 At A&P Fencing we manufacture and stock a wide range of trellis fence panels. Trellis can be used to add additional height to your fence panels with a decorative look or just simply as free standing panels for a discreet but stylish finish to your garden. 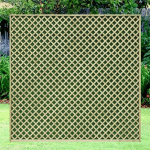 All of our trellis panels are manufactured on our ‘trellis master’ machine to ensure the highest quality, 100% consistency and a long-lasting product. Trellis is a popular choice for gardeners and home owners all over the country who are looking to add something different to their garden. Our trellis fence panels are well built and made to last, ensuring your trellis will stand the test of time. There are several reasons to buy garden trellis and many ways trellis panels can be used. The versatility of quality trellis fencing is a major benefit and allows you to get more for your money as they serve multiple purposes. 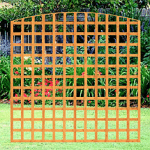 If you’re looking to add some privacy to your garden but not completely shut out light and allow your garden to still feel open, trellis is a great option. Due to the fact that trellis panels aren’t solid, they allow a sense of open space in your garden and provide a softer border than a regular fence panel. Trellis fencing is also ideal for blocking off areas of your garden or property that you might not want people to see, such as a bin or composting area. One of the main reasons people buy trellis fence panels is to provide support for plants and allow them to grow vertically up the trellis. 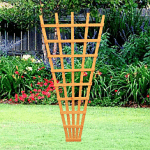 If you’re looking for a smaller section of trellis fencing for your plants, Fan Trellis is a great option to save space but provide support for your plants.